Students march on Nov. 20 to protest the tuition increase plan. Photo courtesy of Jasper Lyons. 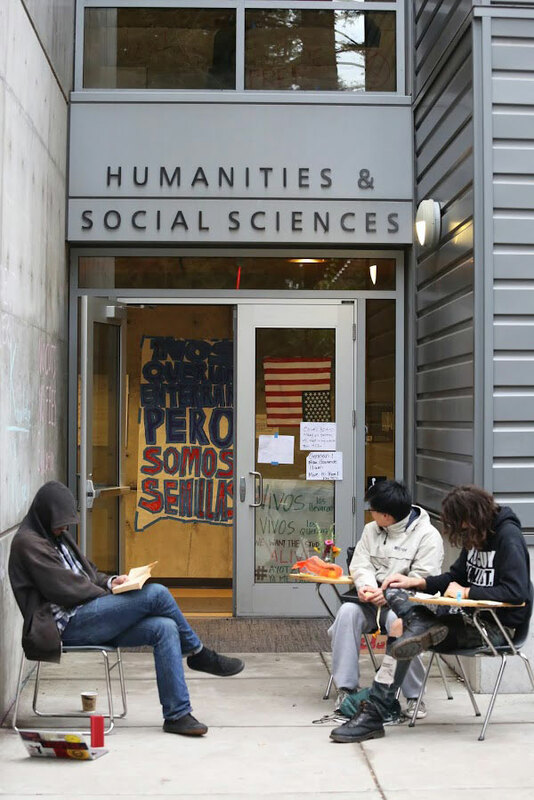 Two UC Santa Cruz police officers notified students occupying Humanities 2 that they were in violation of university policy and California law. 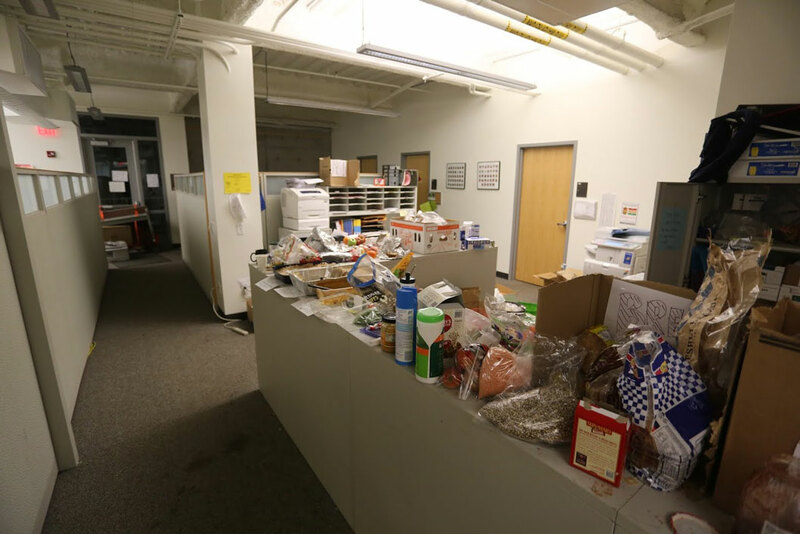 The officers notified the students, who have occupied the building for six days now, that continued occupation could lead to disciplinary action, including arrest. 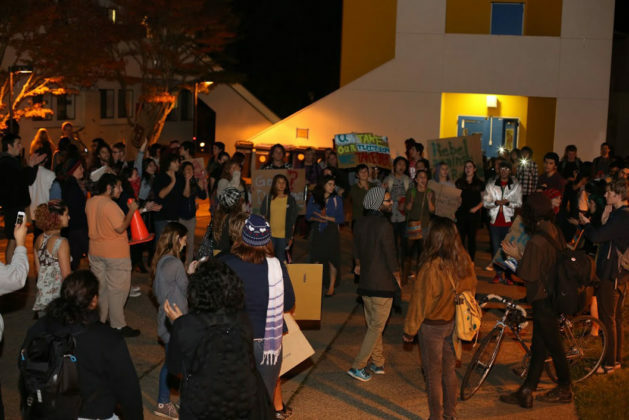 UCSC students have occupied the Humanities 2 building in response to the most recent tuition increase plan, opting to remain in the building until the plan passed by the UC Regents on Nov. 20 is revoked. 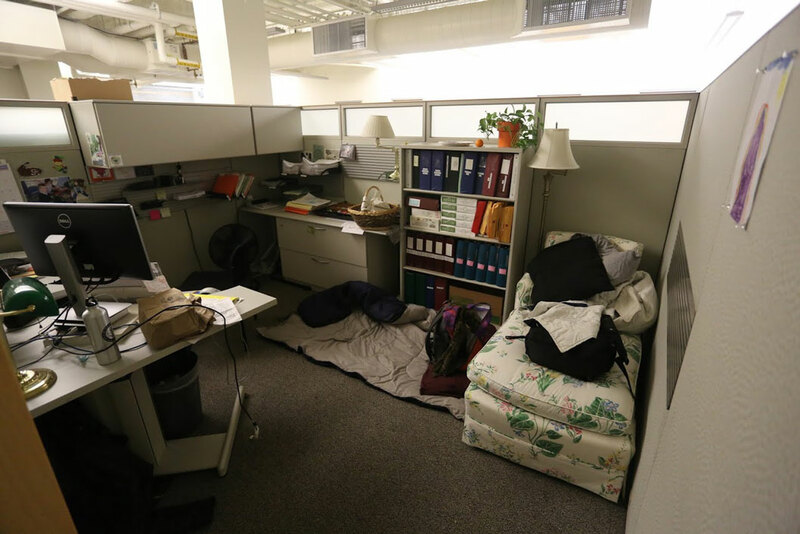 Officer Harper said the occupation constitutes trespassing, which is in violation of both University of California rules and the California Penal Code. 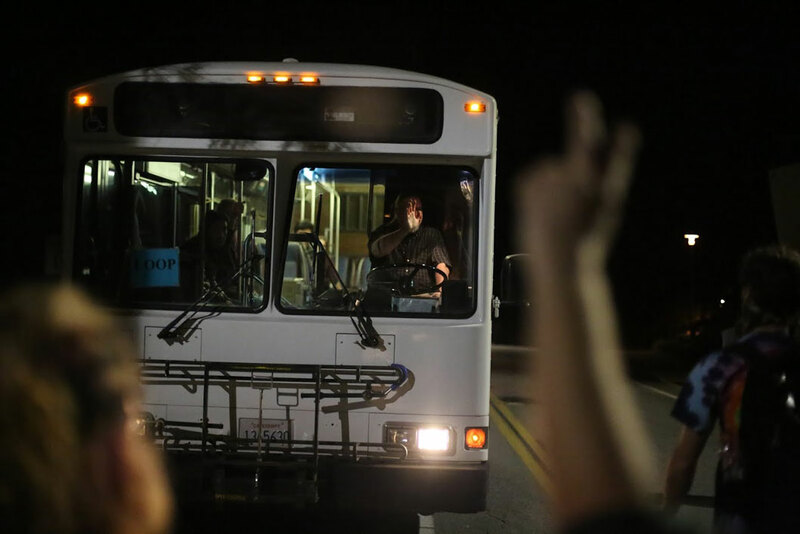 He said there would be no evacuation of protestors for the remainder of the day, but that the evacuation could take place anytime within the following days. UCSC police also reported two separate crimes during the occupation via an email to students. The first was a case of attempted sexual assault, sexual battery and false imprisonment with violence during the night of Nov. 22. The second was attempted robbery, an assault causing injury and false imprisonment with violence on Nov. 23 between midnight and 12:30 p.m.
Harper also said a dispersal notice would be issued prior to evacuation to allow those who do not want to be arrested to leave the premises. The full UC Regents board approved UC President Janet Napolitano’s proposal to increase tuition 5 percent each year for the next five years on Nov. 20, given current state funding continues. Students and community members protested before and during the Regents meeting on Nov. 19-20, which was followed by on-campus rallies, marches and the occupation of Humanities 2. Occupation movements were also taking place at UC Berkeley (UCB), UC Davis and UC Riverside. 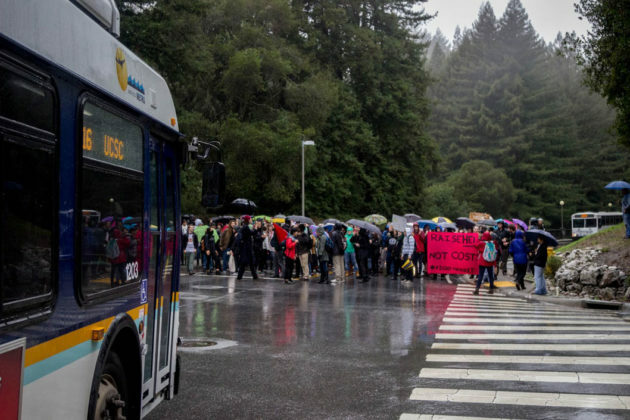 UCSC and UCB student protesters contacted each other over Skype as well, to express solidarity and coordinate any subsequent actions between the two universities. 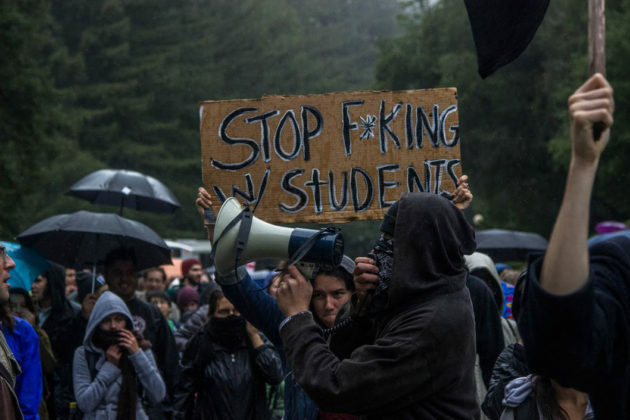 Rallies across the UC have protested the tuition hikes. The occupation began with a rally the afternoon of Nov 20. 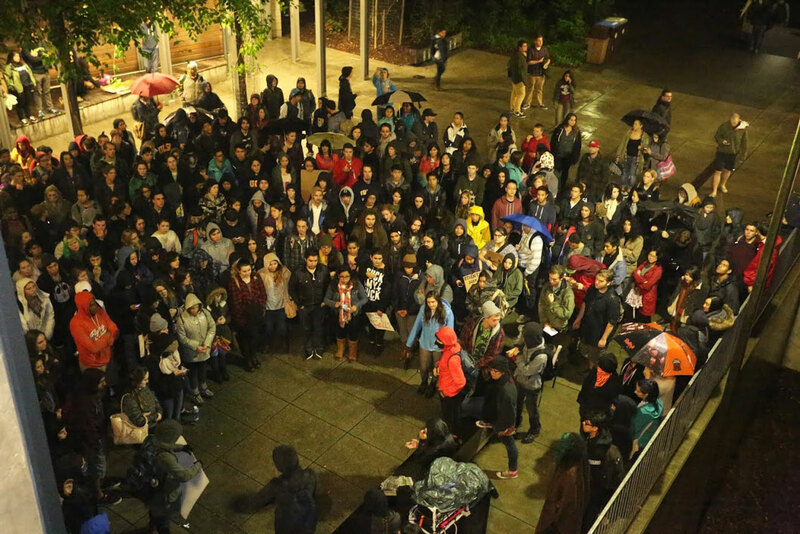 About 450 students gathered at Quarry Plaza despite the rain to march through Classroom Unit 1 and 2, ending at Humanities 2. 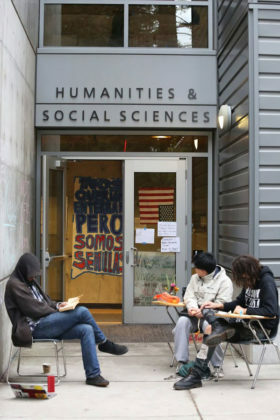 The decision to occupy Humanities 2 came after protesters heard administration was expecting their presence at Hahn Student Services and Kerr Hall. Students chanted, organized and danced in solidarity in support of the UC-wide demonstrations. 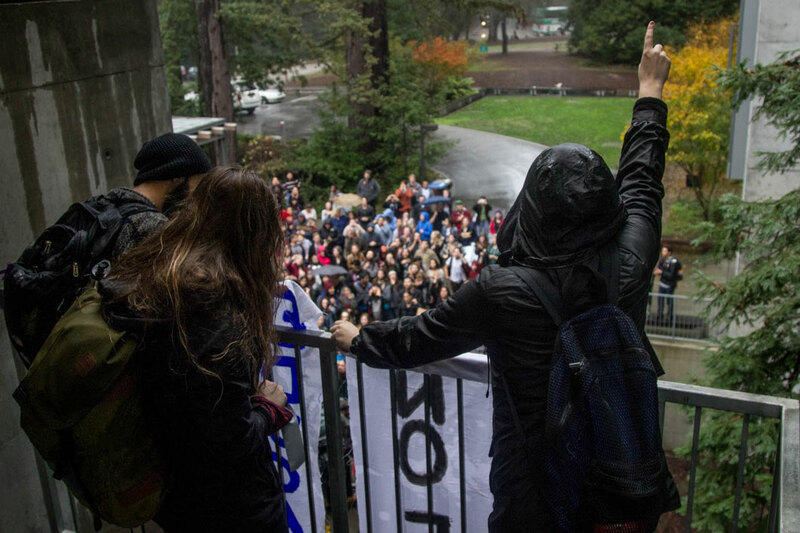 Several students at the occupation continued to express their frustration toward the state and the Regents. “It’s absurd that these 12-year political appointees, these millionaires, CEOs and investment bankers are the ones who are making decisions about how a nominally public university is run,” said a student who chose to remain anonymous. 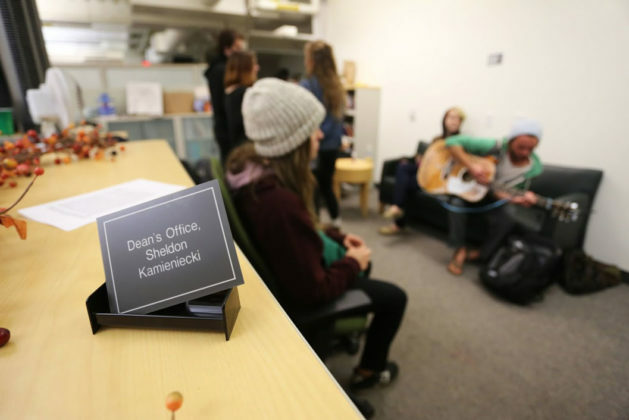 The decision to occupy Humanities 2 was also to create a space where students could share their personal stories and opinions about how the tuition hike will affect them and their peers. 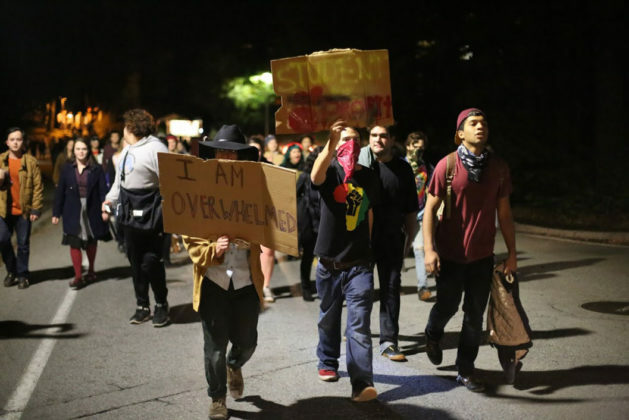 At 6 p.m that night, students gathered for a general body assembly to discuss occupation protocols and logistics. 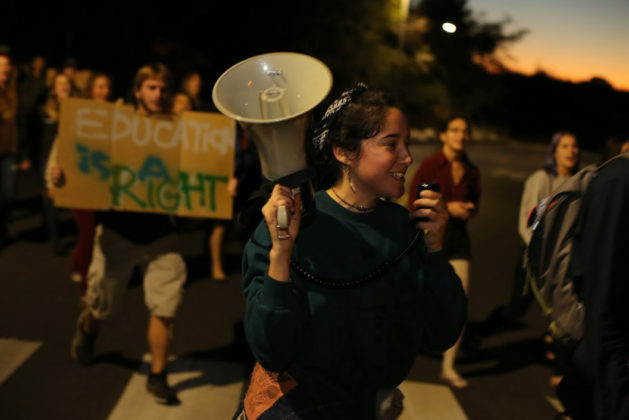 They voted to continue occupying Humanities 2 until the tuition hike proposal is recalled. The students also chose to prevent classes and sections from taking place the following day. Portable speaker in tow, protesters had an impromptu dance party outside the building that evening. The following day, Nov 21, student organizers and protesters put together workshops to create a safe space for those occupying the building. Workshops such as “Education for What? Calling out U.S. Imperialism” and “Consent Culture” were offered throughout the day. Another general body meeting took place that same day at 6 p.m. to discuss possible future actions. 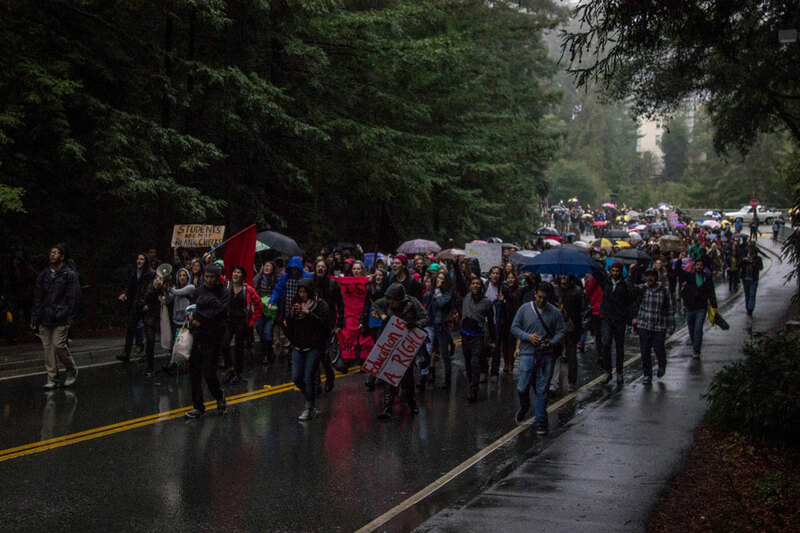 On Nov. 24, protesters organized another march. Approximately 150 people participated, starting at Humanities 2 making their way to Oakes College and back through Upper Campus. 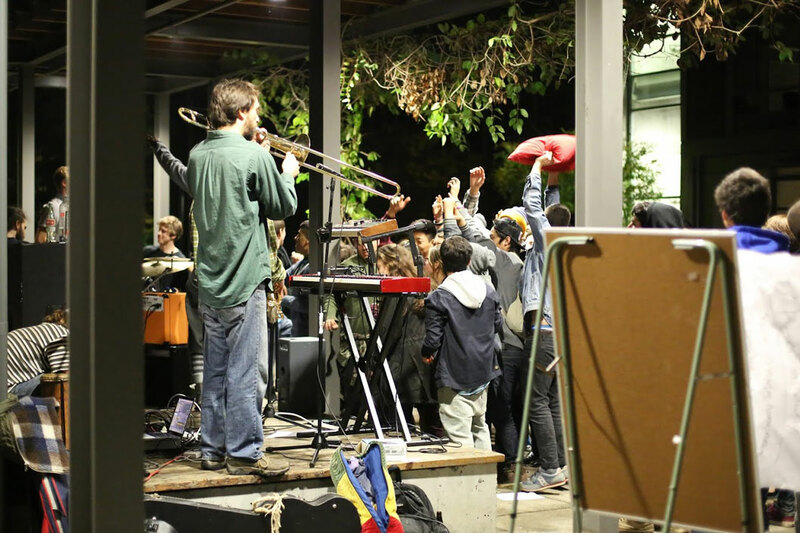 A student organizer, who chose to remain anonymous, said he wants to reach out to students and bring them into the conversation, rather than focusing all of the attention on the UC Regents. He said the goal is to become so powerful to the point where Regents won’t make decisions in opposition of the needs of students. “Its not about getting people to do what you want in power. It’s about making the situation such that it’s impossible for them to not do what you want. 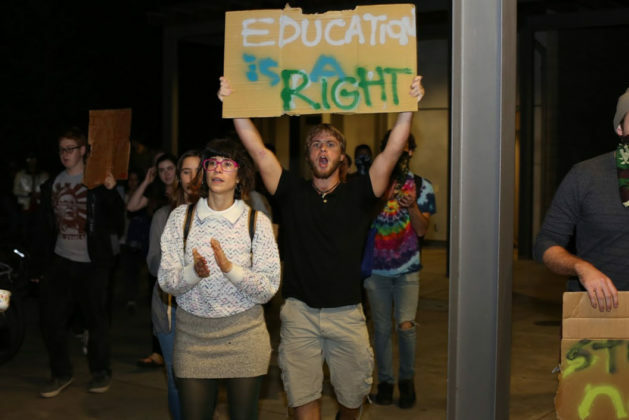 More occupations, more militancy and maybe even building toward a student strike is the only thing that is going to prevent this from going into effect,” the student said. 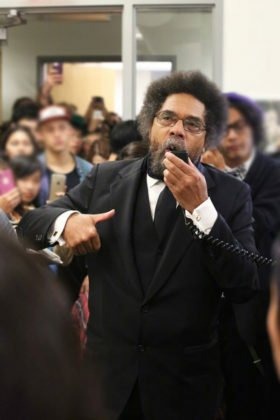 At around 10:30 p.m., student demonstrators were joined by Dr. Cornel West, who headed to the occupation following his lecture at Speaker Blowout: Racism, Ferguson and the Media. The professor, activist and author greeted students with hugs as he made his way through the building.